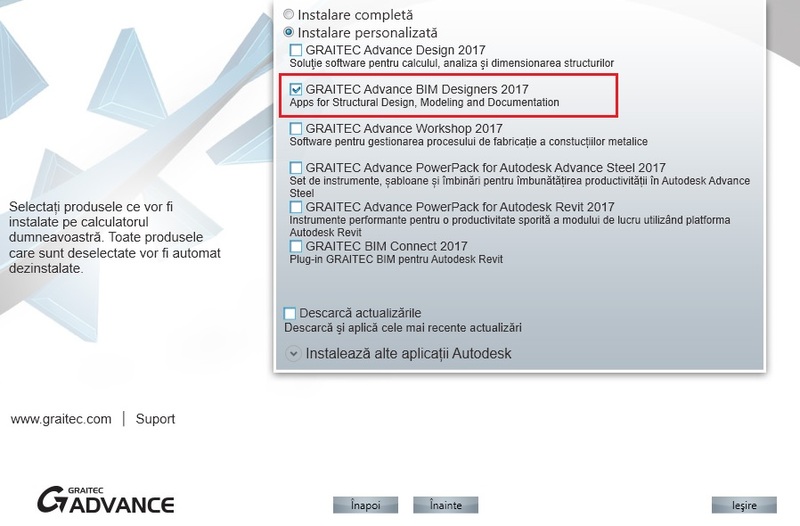 Pentru a instala Advance BIM Designers, va rog accesati contul dumneavoastra de Graitec Avantaje pentru a descarca sau instala online Advance Setup 2017 R2 (conform imaginii atasate).In interiorul setup-ului, in sectiunea “Instalare Produse”, bifati “Graitec Advance BIM Designers 2017”, pentru o “Instalare Personalizata”. To help you solve the issue, we need some information:1. What version of Advance Design did you install? How did you install Advance Design: using the global setup or did you perform a manual installation of the .msi?2. Did you install Advance Design before or after installing Windows 10? Did you perform an install or an upgrade for Windows?3. Did Advance Design function before the W10 install?